Horizontal attacks are a suitable tool to evaluate the (nearly) worst-case side-channel security level of ECC implementations, due to the fact that they allow extracting a large amount of information from physical observations. 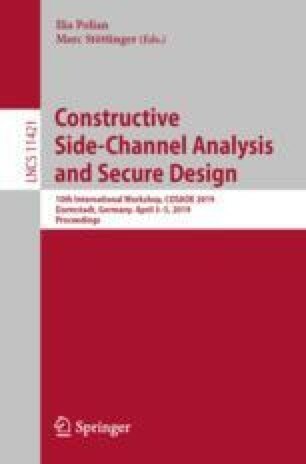 Motivated by the difficulty of mounting such attacks and inspired by evaluation strategies for the security of symmetric cryptography implementations, we derive shortcut formulas to estimate the success rate of horizontal differential power analysis attacks against ECSM implementations, for efficient side-channel security evaluations. We then discuss the additional leakage assumptions that we exploit for this purpose, and provide experimental confirmation that the proposed tools lead to good predictions of the attacks’ success. François-Xavier Standaert is a senior research associate of the Belgian Fund for Scientific Research. This work has been funded in part by the European Commission through the H2020 project 731591 (acronym REASSURE) and by the ERC Consolidator Grant 724725 (acronym SWORD). The authors would like to thank Vincent Verneuil for the valuable comments and the fruitful discussions. In the point doubling algorithm described above, the multiplication by \(a=-3\) is done using field subtraction, leading to one less field multiplication.